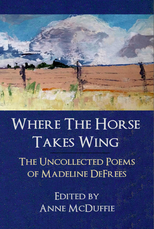 Where the Horse Takes Wing, Madeline DeFrees’ uncollected poems, published in her centennial year, afford a reader the unique opportunity to follow the arc of a poet’s vision for sixty of her ninety-six years, from the convent to the university, to her beloved garden. Madeline was world wise, and that wisdom infuses these poems.“Everything that moves, loves and is afraid,”she once wrote, and in a single line one recognizes her deep compassion for all creation. That said, she was also discerning and pragmatic—with a sense of humor. One sees it pointedly in her closing poem, “Pre-Need Planning”: “Caught up in details: bills for burning my bones/and delivering ashes. Cost of an urn/ for the ashes and a place to keep them – I lament this long distance dying. Why must I choose/memorial music when the melody //in my ear is Today?” Her life and her poems were both spiritual and spirited, and in that way her work provides a blueprint for the examined life. She is a role model for poets, and we are grateful to her literary executor and editor, Anne McDuffie, for so carefully assembling and making Madeline DeFrees’ work available for the world.